Researchers found exposure to the Progresa program has a positive impact. This article was previously published in the World Economic Forum Blog on June 20, 2018, in collaboration with NBER Digest. 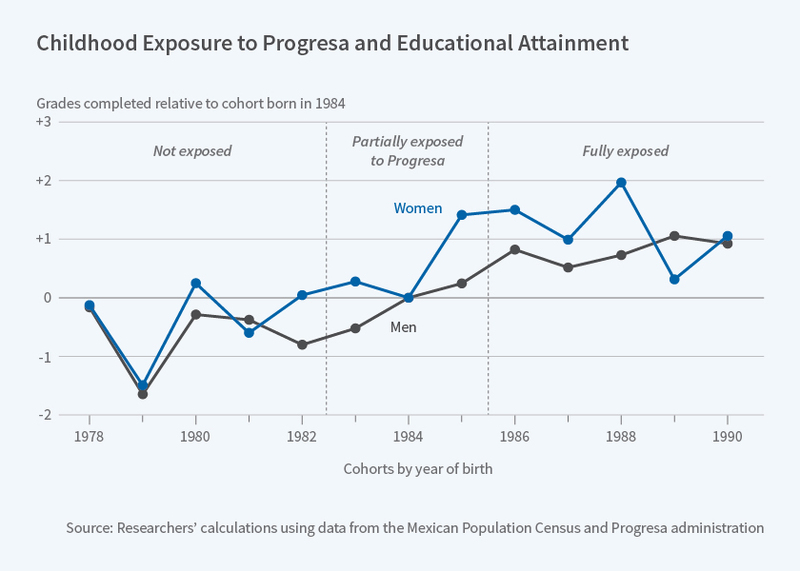 Childhood exposure to Mexico's Progresa program raised average educational attainment by 1.4 years. Girls were 30 percentage points, and boys 18 percentage points, more likely to obtain some secondary schooling. More than 80 countries around the world currently administer conditional cash transfer (CCT) programs that provide low-income families with money in exchange for their engaging in certain behaviors. Studies of these programs have often found positive short-term effects on education and health outcomes, but evidence on the long-term and intergenerational effects of these programs has been limited. In Do Conditional Cash Transfers Improve Economic Outcomes in the Next Generation? (NBER Working Paper No. 24303), Susan W. Parker and Tom Voglstudy one of the best-known CCTs — Mexico's Progresa program. Progresa was rolled out in rural areas of the country beginning in 1997. It provides low-income families with cash conditional upon their children attending school and family members visiting a health clinic for regular checkups. Today, the program covers 6 million families — about a quarter of all Mexican families — in both urban and rural areas. Using data from the 2010 Mexican Census of Population and Housing Units, the researchers compared individuals in two birth cohorts: a younger group that was exposed to Progresa before the age of 12, and therefore was affected by the program, and a slightly older group whose members were too old to be affected by the time the program was rolled out in their area. The researchers find substantial education effects for children exposed to the program. On average, those who were under the age of 12 when the program became available completed 1.4 grades of education more than the older cohort. Women exposed to Progresa as girls under the age of 12 were 30 percentage points more likely to obtain some secondary schooling; men were 18 percentage points more likely. Childhood exposure to the program also increased the probability that a child would complete some high school by 10 to 15 percentage points. The researchers conclude that "the estimated education impacts represent remarkable increases in educational attainment among children who grow up with Progresa." Perhaps not surprisingly, given the large education effects, cohorts exposed to the program also exhibited better labor market outcomes. Childhood exposure to Progresa increased labor market participation of women by 7 to 11 percentage points, and increased earnings by $30–$40 per month. The effects were smaller for men, but still meaningful. Men in the cohort that was affected by Progresa worked an average three hours a week more than those in the older, not-exposed cohort. They were also more likely to work in the formal labor market and in non-agricultural occupations. Earnings impacts, while positive, were statistically insignificant for men. However, the researchers find significant effects on sectoral average earnings among male workers, on the order of $40–$50 per month. Progresa exposure also improved both housing conditions and ownership of durable goods. The economic benefits women derived from childhood exposure to Progresa are at least partially driven by a "moving to opportunity" effect. Women exposed to the program as children were more likely to migrate and to live in urban areas. The researchers conclude that "these results suggest that CCTs and their accompanying educational gains, have important economic consequences for the next generation." Have Latin American Countries Become More Competitive? Does government support lead to productivity growth?